There are three reasons why diplomatic personnel who hold secular or non-religious beliefs, and who work on peacebuilding, are generally insufficiently equipped to understand and address religion when it comes their way. First, for some diplomats, religion in conflict lacks relevance. They see the main factors of a conflict to be of an economic or political nature, or they believe that if religion is addressed as a topic in its own right, it will quickly grow out of proportion. We all have our personal biases. However, their foreign ministries’ secularist approaches to diplomacy and peacebuilding have clouded such diplomats’ views on today’s landscape of violent political conflicts, of which the majority contain a religious dimension. Such conflicts include those in Syria, Myanmar, Yemen, Somalia, Mali, Libya, Thailand and Nigeria to name a few. This is not to say that religion is the only element that is driving these conflicts nor that religion is necessarily the most important one. However, if lasting peaceful solutions are to be found for these conflicts, religion’s relevancy should neither be under- nor overestimated – its role needs to be adequately understood and addressed. Second, some diplomats recognize the importance of religion in armed conflict today, but don’t believe that there are ways of addressing religion constructively. Diplomatic personnel, particularly in Western Europe, who recognize religion’s importance, often don’t know how to engage with it as they have become religiously illiterate. This is due to the changing role of religion in their societies as well as their personal beliefs, which are often shaped by secular values and only connected to a broader cultural tradition of religion. Because of their religious illiteracy, this group may experience helplessness when faced with religion in conflict because their traditional secular diplomatic tools may not work. Thus, they assume that there is nothing that can be done. As Jayne Docherty puts it: “The challenge of our time is learning how to manage, negotiate or navigate through multiple worlds.” This blog argues it can be learned. Third, a growing number of diplomats believe religion in conflict plays an important role and think that tools for addressing it exist, but they cannot find training opportunities that fit their needs. Only a marginal number of courses are offered by what we may call diplomatic peer organizations (governments and multilateral organizations). According to a survey of 2017 conducted by the Al Amana Centre and the Network for Religious and Traditional Peacemakers, only 6% of courses on religion and peacebuilding target diplomatic personnel specifically. It is not surprising, then, that diplomats are often still not equipped to deal with religion in armed conflict. They simply have not yet found suitable ways to gain the tools for understanding and addressing religion’s role in conflict, as well as for engaging with religiously-inspired political actors, as the Al Amana survey confirms. What can be done? The first group of diplomatic personnel contest religion’s relevancy in violent political conflict and peacemaking. 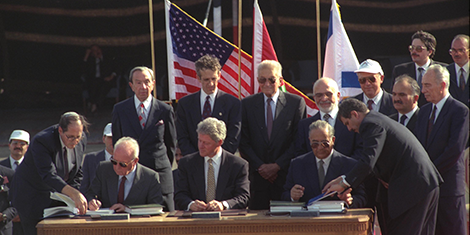 Nevertheless, the failure of diplomatic peacekeeping in negotiating the Geneva accords on the Israel-Palestinian conflict can at least partially be seen as a result of the lack of willingness or ability to engage with religious actors. These diplomats therefore need to understand that their secular worldview is one way of making sense of the world, but not the only one. Ignoring the relevance of religious actors minimizes the impact of peacemaking. This is why concepts such as ‘religion’ and ‘secularity’ should become an integral part of basic diplomatic training. This would encourage critical self-reflection on one’s own biases regarding peacebuilding and increase one’s sensitivity to the fact that religion plays an important role in many people’s daily lives. The second group of diplomats, who don’t believe there are effective ways of dealing with religion in conflict, need to be shown concrete examples where religion was successfully addressed to demonstrate that it can be done. Such examples could include the Sudan Comprehensive Peace Agreement of 2005, within which the dual banking system respected religious concerns as well as the different actors involved in the conflict. Experts engaged in the peacebuilding practice of addressing religion in conflict often focus on the methodological level. However, this second group of diplomats is less interested in the nitty-gritty of technical approaches, and just wants to learn about practical success stories that illustrate something can be done. The third group of diplomats, who are convinced of religion’s relevancy in conflict and who are looking for ways to equip themselves with the tools to address religion and secularity in conflict, need training tailored to their needs. This refers to organizational considerations such as shorter courses, which might only last for few days rather than a full semester. It also applies to methodological elements such as case studies that reflect and provide insights into the complexity of their daily work contexts. To read more about what elements to keep in mind when developing and organizing such courses, see this report on the compiled reflections of practitioners on training on religion and secularity in conflict for peacebuilding gathered at a workshop that took place in 2017. Apart from logistical and content elements, diplomats need to be able to easily find the course they need online. While this task was difficult in the past, it has been made much easier due to the provision of a newly organized online list of training courses and workshops put together by the Network for Religious and Traditional Peacemakers. What course organizers need to do now is to register their training programs with such platforms and provide information about their courses such as their target audience, course goal and key content messages. This will enable potential participants to know what to expect before registering for or even taking the course. Is it to improve basic knowledge about religion in today’s world? Is it to acquire a framework for analysis? Is it to learn about and practice how to address religion in conflict? Is it to obtain a particular set of skills for engaging with religiously-inspired political actors? Or is it to gain insights into a particular conflict context and its religious dimensions? Often training courses will highlight a particular sub-set of approaches, such as mediation, faith-based or rights-based approaches. If a training program clearly advertises what it is about and how participants will be supported to meet the course goals, chances are that expectations can be met. Apart from the questions above, diplomats also need to get clarity on what form of training they would benefit from most: a summer school, on-the-job coaching, or a block course. If diplomats are looking for inspiration from peers from other contexts, then a training program with a well-selected group of other participants will be important. An example of this is the Religion and Mediation Course, in which participants from the diplomatic, religious and NGO-spheres benefit from learning together. As a general guideline, training should not be a goal in itself in peacebuilding, but part of a bigger strategy for change. Be it from the perspective of a diplomatic participant or of a course organizer, when training ends, participants need to be equipped to put what they have learned into practice. If that’s not going to happen, it may be wiser to spend time and effort in a different way. Angela Ullmann is a senior program officer at the Center for Security Studies (CSS) and works on the Culture and Religion in Mediation program. She is a co-organizer of the Religion and Mediation Course and has contributed to training for the UN Department of Political Affairs, the OSCE, the Regional Center for Mediation and Dialogue in Egypt, the Austrian Study Centre for Peace and Conflict Resolution, the MAS Mediation in Peace Processes at ETHZ, several local NGOs and different Swiss Universities.